I have to learn a new language! Nasty day for a drive, but even so, this is one beautiful countryside! 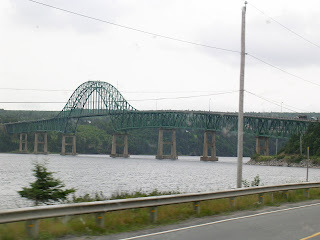 Miles and miles of hills and mountains, way more mountainous than the other Maritime Provinces, heavily forested, with lots of fast moving creeks and rivers. I had to laugh – 50 years behind the times? The few homes I was seeing all had at least one satellite dish! The roads are in good repair for the most part, a treat, and they have well labeled ‘bump’ signs, as opposed to those in Nova Scotia which are right at the bump, offering no warning! And my Sirius radio is still working, which is a pleasant surprise! I found myself thinking the trees were considerably smaller than on the other islands, then I began to see more and more areas that had been clear-cut. So apparently what I’ve been seeing is new growth. Interesting though, because there was a great mix of trees, so it doesn’t appear to have been re-planted by the lumber companies. Plus, they seem to cut the trees at a younger age, because the trucks were hauling small diameter logs. This may seem like more information than you would expect to see from me – for the first hundred miles or so, that’s pretty much there was to see. Most of it comes from the fact that my cousin Norm, on Vancouver Island, was a forester, so I learned a lot of the business from him. It seems the intent of the road builders is to keep traffic away from any towns, so the drive was peaceful and green, and up on a large plateau followed the course of a river, hence was simply gorgeous! 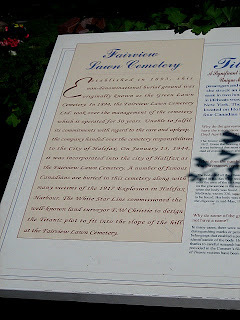 But with only trees to look at, I decided to take a little side trip to see the town some of the small billboards had been advertising – Stephenville. Clever signage – probably inexpensive for the town as each sign saying Stephenville was, say 28 km away, the bottom of each sign advertised a business, from restaurants to car repairs to beauty shops. There is obviously a major wind tunnel thru here – the trees are all bent, and none of the homes near the water have windows on the ocean side! Makes me wonder why they even build there!! The town took me very much by surprise. There is a large, very modern hospital on the outskirts of town, with a very attractive retirement home across the street. So much for everything being 50 years behind times! There is a good sized airport there, with the landing pattern bringing you in over the ocean, with the planes touching down right past the roadway! And then there’s a large shopping center with all the big names – Wal-Mart, Staples, all the fast food, etc. Passed by Marble Mountain, a big ski resort with all the associated businesses, for all seasons. Looks like a very prosperous area. And certainly more current than I had been led to expect! The Deer Lake area is stunningly beautiful. Lots of sporting activities. The first farming I have seen, with roadside stands offering fresh produce and raspberries! And the area is wild with wild flowers, so I has happy!! The road off the main highway leading to my destination for the next couple days was up and down and curvy and spectacular. Oh, how I wish the sun had been shining – that’s the only thing that could have made that drive any better. What a gorgeous place!! 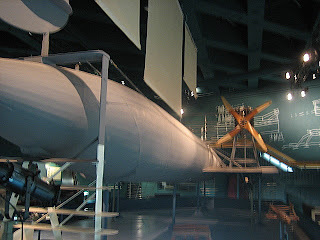 NewfundLAND has many claims to fame to its credit – they were the first to respond to the Titanic’s distress signal, the first to vaccinate for smallpox, the first to host a transatlantic flight, the first to have wireless communication in the world, the first place to discover proof of the theory of continental drift! 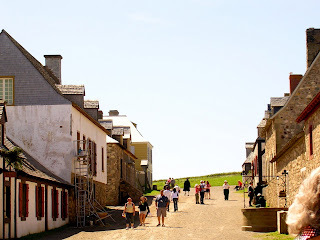 They have the oldest street in North America, the oldest city it North America, the oldest rock in the world (huh?) 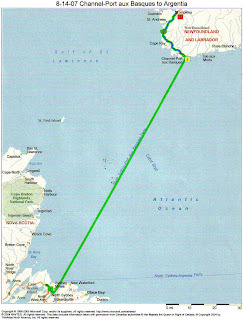 (actually other Canadians call NewfundLAND ‘the Rock’), the oldest continuous sporting event in Regatta Day, the largest university in the North Atlantic, the most pubs per square foot in Canada on George Street in Saint John’s, the longest running radio program in North America, and some poor soul caught the largest invertebrate in the world – a giant squid! They also claim to be the funniest people in Canada (ask anybody), the sexiest people in Canada according to Macleans magazine, the only province that has four identifiable flags, the only province able to land the space shuttle (in Stepenville – no wonder I was so impressed with the airport! ), the most giving people in Canada according to government statistics, and the most sexually active people in all of Canada (as they say, what else are they gonna do?)! A Newfie built the world’s first artificial ice arena, invented the gas mask, was a governor or Norther Rhodesia, and was with Abraham Lincoln at Gettysburg! 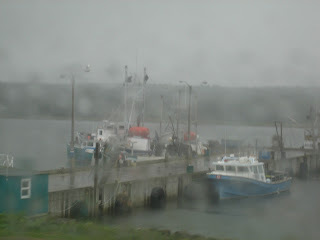 Headed out early, after unhooking in a drizzle, to get to the ferry terminal by 7:30 am for the seven hour ride to Newfoundland. Not Newfundland, mind you, as I’ve always said it, but NewfundLAND! They speak a different language in this place, and that’s for sure! 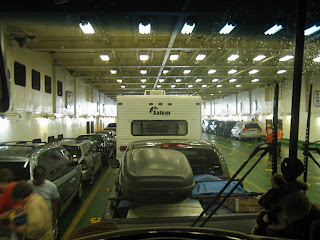 I had considered renting a car and driving over for a few days, rather than bringing the coach, but after careful study, plus the fact there wasn’t a rental car to be had anywhere, I decided to go ahead and take the ferry. Overall, me thinks it will be cheaper in the long run. The RV parks are inexpensive, and the hotel rooms are pricey! Getting to the ferry was a snap – 10 minutes from the Arm of Gold park in North Sydney, where the Good Sam Tour ended up. Had just enough time to walk Penny and turn off the propane, and it was time to board. 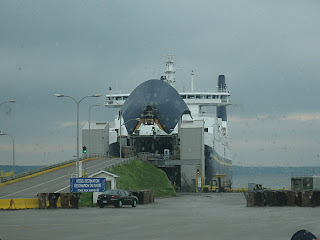 This is quite a ferry – big, for one thing, which is a treat after the last ferry ride! They offered live entertainment off and on throughout the day – NewfundLAND mandolin, accordion, spoons, and a multitude of other instruments played by a youngish couple who obviously love sharing their Newfie heritage! They were delightful! 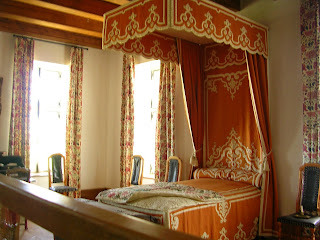 There was a video game room, and a play room for kids, and numerous seating arrangements plus private rooms which could be rented for extra. Plus the cafeteria actually served decent food at a reasonable price. All in all a pleasant crossing, even in less than pleasant weather! Except for poor Penny who had to stay in the coach by herself. She wasn’t pleased. But the option was for her to be locked in a tiny little crate on the main deck, and I know she’d have like that a whole lot less! Left at 9 am, and arrived about 4 pm. Mind you, NewfundLAND operates in a different time warp – they have their own time zone, a half hour off from anywhere else! I’ve already heard complaints from people about figuring out when TV shows are on – as if there was any TV to watch here. I get one channel, poorly, playing what is very obviously local stuff, ‘cause I can barely understand what they’re saying. 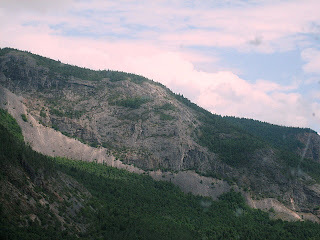 The countryside is lovely though – way more mountains than the other Maritimes. Unfortunately the first thing one sees when leaving the ferry terminal is a large cemetery. You’d think the province could route the visitors another way, to have their first visions be of something a little more . . . alive?? Then you immediately pass by a lumber mill of some sort, spouting clouds of smoke, making visibility even worse! Once past that though, the countryside opens up to green and beautiful! It’s illegal to drive while using a hand-held cell phone! Good for them!! Sales tax is 14%! Yikes! Legal age to purchase booze is 19, but you better not have a blood alcohol level of more than .05 milligrams and be behind the wheel! That’s a serious ‘don’t drink and drive’ rule! 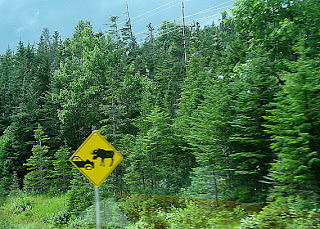 Moose warnings are serious and do catch your eye. The moose is going to win if you have a confrontation on the road! There are no snakes, raccoons, skunks or porcupines on the island! I had heard some of the ferry crew talking amongst themselves, saying that NewfundLAND is 50 years behind the times. You get that feeling just looking at the small businesses and the vehicles on the farms. But the people make up for it all. They are delightful – friendly, happy, laughing. I’m glad I came! Except for the nasty little black flying things that bite! Bug spray, before going outside again!! 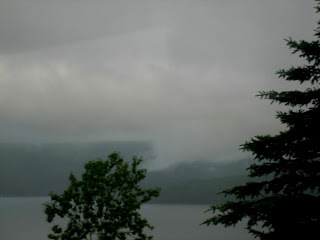 And sadly too, the weather was so dreary that I didn't get a single decent photo. Surprisingly, there are two other campers from Arizona here right now – one couple even has a home in Tucson, only about a mile and a half from the RV park I’m looking at for future wintering (when I’m not in Mexico)!! 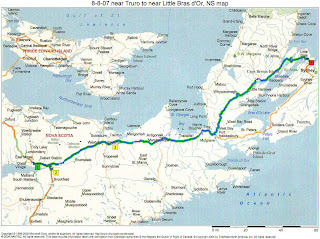 I suspect I’ll see Bill and his wife on the road off and on for the next several days, as it seems we’ll be covering the same ground! Small planet – I’m about 6000 miles from home and meet a neighbor! Maggie took off this morning, gratefully accepting a ride down to the States with another of our caravaners. I’m sorry to see her go – it was great fun having someone to share this last couple weeks. I’m delighted to have been invited by Dianna and Stiles, another couple on the tour who stayed behind for a couple more days of adventure, to go on a Bird Islands Boat Tour this afternoon, in search of puffins, as well as whatever else might turn up. Took a little doing to find the site of the boat trip, but we’re certainly glad to we went! It’s a family run business, out of their home, and was fun!! 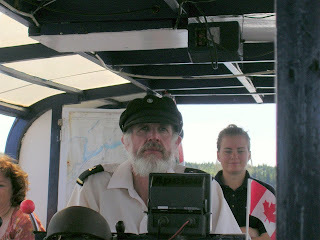 Our captain was the perfect picture of a sea going man, and had plenty of tales to tell. His son, Ian, did just about everything, and was an articulate enjoyable young man! 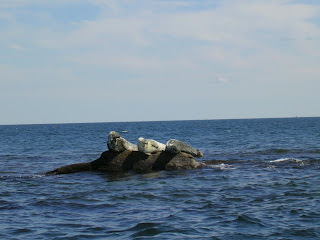 We saw plenty of seals and bald eagles (Captain Vince told us about 25 times why he absolutely does not like eagles! 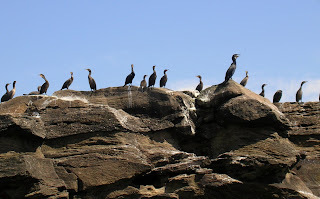 ), and about 10 other varieties of birds. If you can bring this picture up, there are two bald eagles here! Thankfully we were in the boat and not in the water when we passed through a huge school (??) 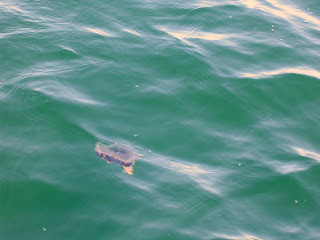 of jellyfish! We were lucky enough to see a small school of dolphins too! Plus lots of gray seals! Wonderful end to the tour!! I’m going to sleep for days! We were warned ahead of time that this would be a long long day of walking. I chose to stay home and recuperate, and let Maggie be the photographer of the day. 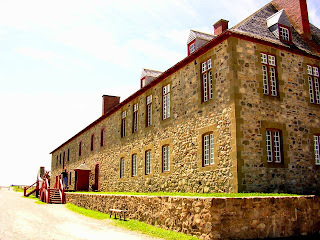 The Fortress of Louisbourg National Historic Site was once a busy fortified seaport – it was the administrative capital of French holdings in Atlantic Canada – a fishing base for cod – a center for trade with over 100 trading vessels a year sailing in and out of the harbour – an Anglo-French battleground in both 1745 and 1758. 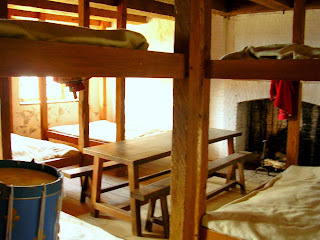 Each summer, the Fortress springs to life as dozens of costumed animators become the town’s residents of the summer of 1744. Men, women and childred enact the range of society fro mthe leisurely activites of the rich to the hard physical albour of the poor – engineers, musicians, soldiers, merchants, street vendors, bakers, servants and fishermen…dancing, cooking, gardening, musketry and more. 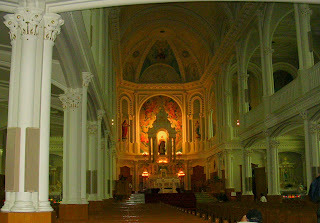 Therea re over 25 buildings open to the public. And this was the day we had wished for yesterday, so Maggie was able to get a couple shots representative of what we might have seen. Another 12 hour day on the bus in ghastly weather. 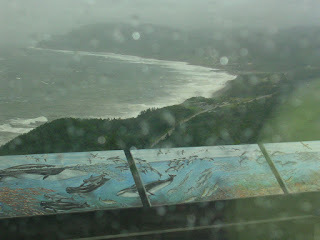 A shame, because the drive on the 184 mile Cabot Trail would have been spectacular – what a gorgeous part of the world! Our guide today, Peter Steele, did a terrific job of filling us in on every possible bit of information he could – he talked non-stop the entire day! 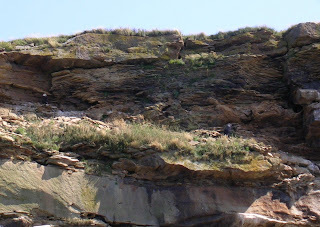 Stunningly beautiful highlands and ocean scenery – when we could see it…steep cliffs and deep river canyons. 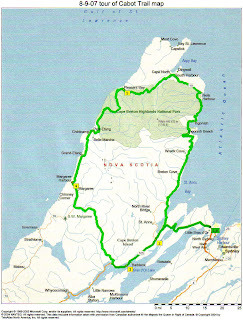 About one-third of the Cabot Trail, which took about 20 years to complete, runs through the Cape Breton Highlands National Park – with a quote ‘cool maritime climate’ (maybe on another day), where we would see a mix of Acadian, Boreal and Taiga plant and animal habitats not found anywhere else, including some Arctic-Alpine plants left over from the last ice age! The first people to inhabit this area were the mi’k maw Indians, and they’re still around after 7000 years! Of the 142,000 people on Nova Scotia today, 12,000 are the mi’k maw. History? 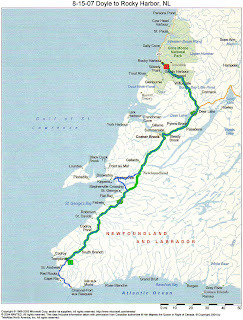 In 1497, the King of England paid John Cabot to try to find China – he made landfall instead on Cape Breton. When returning to England, his ship was stopped dead in the water by the sheer numbers of cod feeding near the surface. This brought the English back to the area in the early 1500s, since the waters around England were pretty much fished out. 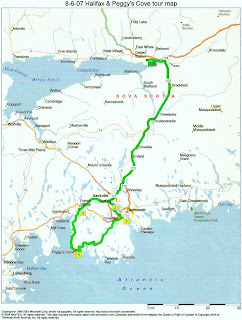 Alexander and Mabel Bell came to Cape Breton from Scotland – he died here in 1922. 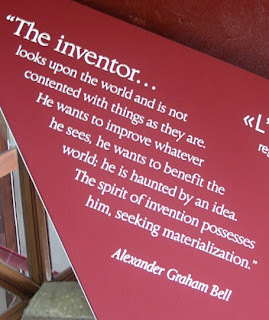 The museum honoring Bell and his many inventions is one of the most fascinating I’ve ever been to. We could have stayed for hours! 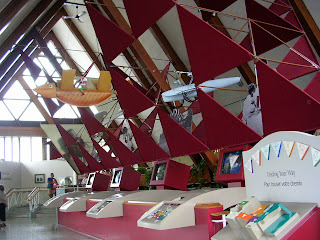 His experiments with kites, his air machines that beat the Wright Brothers! Incredible achievements! The cliffs along the sea on Cape Breton are home to at least 350 pair of breeding bald eagles, who live on a seafood diet! And the area is home to black bear and moose (over 5000 now and growing). The American settlers won’t the only ones cruel to the Indians of the lands they wanted – the mi’k maw were forced to give up their 7000 acre home and accept only 700 acres in the 1800s. 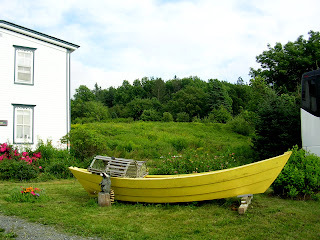 The island has very little top soil – the Margaree Valley is the only area offering good farming, so most family farming is disappearing when the children grow up and leave, just like in the U.S. There is still some land devoted to beef and dairy cattle and to sheep. The palette of green I keep referring to includes balsam fir, white, black, brown and red spruce and some scotch fir, among others! 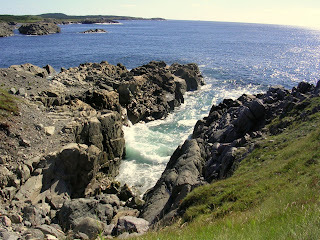 There is not much snow here in the winter, due to the warmth of the Gulf of St. Lawrence. August temperatures can reach into the 100s. As we’re seeing everywhere, the weather here has changed considerably over the last 20 years – the island has experience a major drought, with many wells going dry. 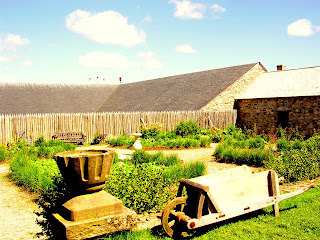 There are still a lot of apple trees, brought over by the Scots. 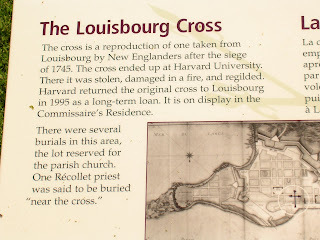 Passing thru the Acadian area, we learned of the French hoping to settle here as New France – they sent plenty of people but no money. The people had to take care of themselves and learned to love the land. They did not welcome the French when they returned, expecting to be in control. The settlers refused to take up arms for the French. 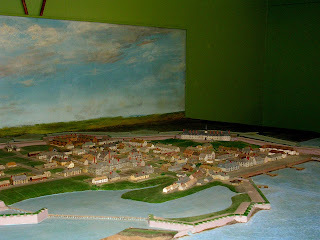 The British were outnumbered by the Acadians, who wouldn’t support them either. This was the time of the 7 year war – the Queen Anne’s war. 12000 people were expelled from the area, but returned after the war. The Acadians are a very proud people, and show their heritage, fly their own flag, live their own lives! We learned that the Gaelic language has only 18 letters, but they make up 113 sounds! Next to impossible to understand! One phrase we tried to learn – “tikity boo” meaning really good! Then there is “ciad mile failte”, pronounced “keyad illa fellchay”, meaning 100,000 welcomes – and “slainte”, pronounced “slon cha”, meaning to your health. 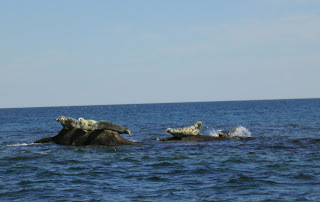 The waters here are rich with 40 species of whales, and serves as breeding ground for gray seals. 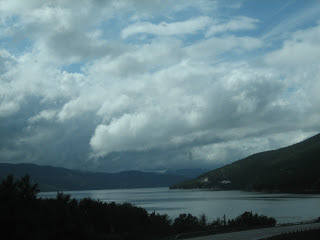 There are 300 lakes in the highlands and innumerable waterfalls. Saw the spectacular Highlands Links golf course, rated 64th in the best 100 in the world. They also have great ice cream! Rumor has it that Bill Gates has purchased a local island, Ongonish Island, but our guide winked at us when he told the story, so who knows. There are reputed to be over 500 ship wrecks off the coast of Cape Breton Island, making this a very popular skin diving destination, particularly in “Wreck Cove”. Recent studies have led some to believe that the earliest settlement here was Chinese, which would certainly change our history books if proven true! 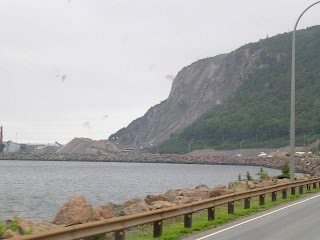 The sun came out about 6 pm today, too late for good pictures, but there are not enough superlatives to describe the Cabot Trail if the sun would shine all day! 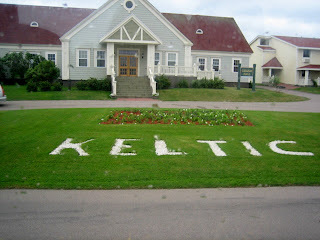 Nice roads on the drive today, but not as well manicured as on PEI. Beautiful yellow goldenrod flowers mass along all the roads. 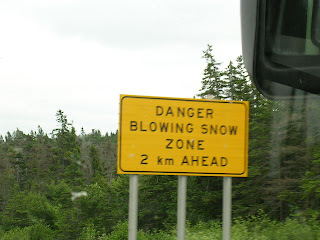 I love the “Blowing Snow” signs – thankfully there’s no snow right now, but the signs make me smile, just like the ones in Arizona that warn of ice on the bridges when it’s a hundred and ten degrees out! It was at least 90% trees today – not even any of the lovely white church steeples peeking thru the trees. Lots of motorcycles cruising the roads – as in many groups of five to ten bikes! Must be a rally somewhere this weekend. They don’t have scenic lookouts in this part of the world – they have ‘look offs’! But there aren’t enough of them, and certainly not enough warning for a big rig to cross the highway to get into the look offs. We passed a large gypsum mine, reminding us that our tour guide had said gypsum was one of the major exports here. 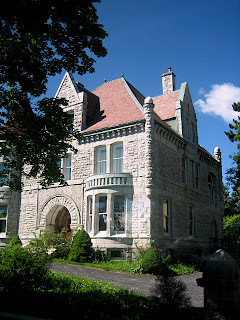 Passed through Baddock – the home of Alexander Graham Bell (which we’ll get to tour while we’re here – I can’t wait!!). Lots of water means lots of bridges, and as you know, I love 'em all! 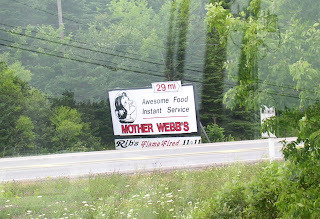 I have to throw in one more picture of a sign that we both enjoyed - we saw at least 30 of this billboard, and one even had a misspelling offering 'flame fried'! We had the day to ourselves, and decided to just take it easy. So I'm just going to throw a couple pictures of the wonderful homes in the Halifax area for your viewing pleasure! 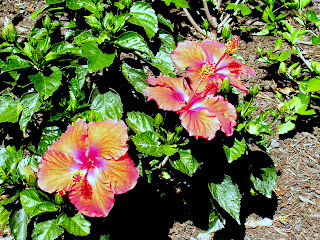 and some more flowers, just because I love them so! 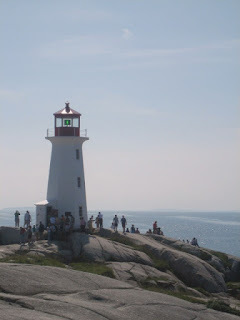 Today held a guided tour of Halifax, it’s Citadel and Peggy’s Cove. All day in a bus – not a pleasant thought. I don’t think these guided tours are for me. Very interesting day though! And thankfully, the folks at the RV park were happy to check on the numerous doggies in our caravan – twice a day walks!! 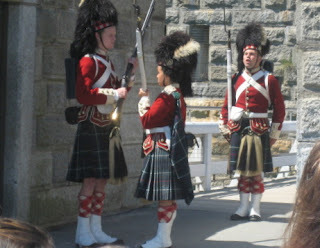 Our guide, Lois, was very good – not as much fun as Tammy in PEI, but very informative. 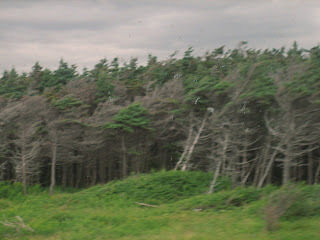 Nova Scotia is about 50% forest, like the rest of the Maritimes. Lovely palette of greens again due to the mix of trees. Lois told us the average income in NS is about $40K, with a minimum wage of $8/hr. Poverty level is at $18,600. One of the major exports is lobster, of course – 44,000 tons of the yummy creatures are shipped every year! Let's see - at an average of a pound and a half, which is what they generally serve, that's more than 58 million lobsters! And season is short, so the lobstermen are busy, and most have more than one job, so they have something to do the balance of the year. The 2nd export is gypsum of all things, on an island covered with trees and a sea full of yummy things to eat! 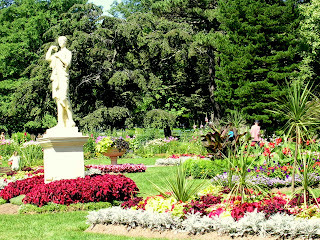 Summer is a great time to visit, averaging in the mid 80s in July and August! Bedford, Dartsmouth and Halifax all sit on the Halifax Harbour – and there is a large contingent of Navy, Army and Air Force here. 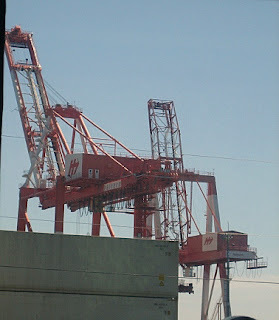 The port has some of the largest cranes in the world for military and shipping needs. The Blue Nose, a racing schooner in the mid 1940s, docks here. 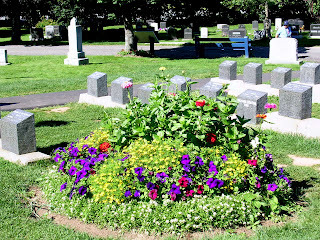 The Fairview Lawn Cemetery, dedicated to the Titanic victims, as some of the first rescue vessels sailed from Halifax, is a beautiful spot. 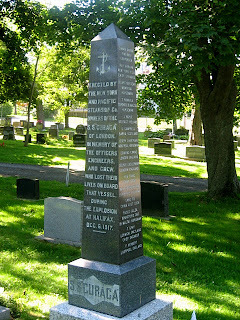 It also serves as the resting place for the victims of a tragic explosion in Halifax on December 6th, 1917. 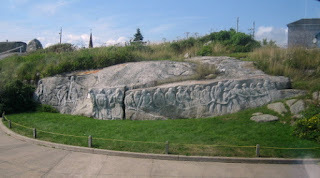 The story is fascinating and can be found at http://www.halifax.ca/community/explode.html . The explosion caused the barrel of one ship’s cannon to land three and a half miles away; part of her anchor shank, weighing over half a ton, flew two miles in the opposite direction. 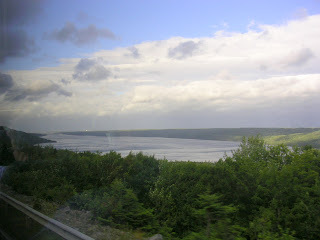 Windows shattered 50 miles away, and the shock wave was even felt in Sydney, Cape Breton, 270 miles to the north-east. We noticed lots of ice cream parlors, and Lois confirmed that Nova Scotians eat more ice cream per capita than anywhere else in Canada! 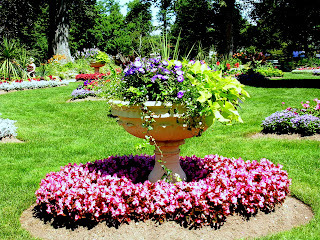 We were invited to stroll through the Public Gardens, which were varied, colorful and absolutely gorgeous! Perfect for flower lovers, as we both are! We saw St Mary’s University, 205 years old, one of five universities in the Halifax area. We learned that one of the local farms grew the giant pumpkin of the year, 1100 kg (since there are about 2.2 lbs/ kg, that means the sucker weighed in at about 2,420 pounds! That’s a lot of pumpkin pies! But the number one produce export is blueberries, and Maggie and I did our best to eat every berry we could find! The wild blueberries are tiny, but oh so good! Tiny!!! 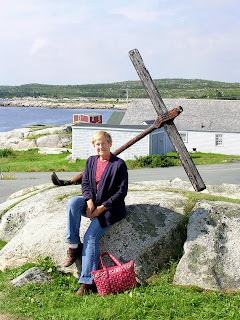 We had a lovely buffet lunch at the Citadel Inn, then headed over to Peggy’s Cove, a picturesque fishing village on the south coast. The old lighthouse is still active, and you may recognize it, as it is considered one of the most photographed lighthouses in the world. It also serves as the post office today. The entire area is, unfortunately, a tourist haven. It is lovely, with the huge granite boulders and breaking waves, but there are just too many people! Good ice cream there though too! 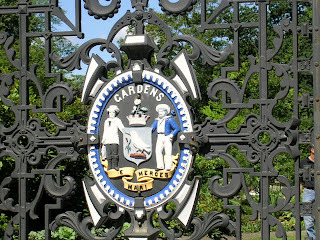 The community is named after the cove of the same name. 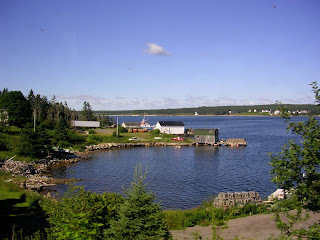 Peggy is a nickname for Margaret, and the village may have taken its name from St. Margaret's Bay upon which it is situated. 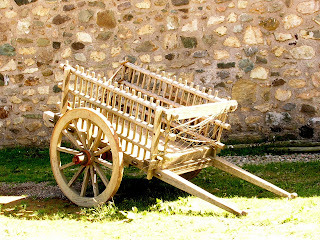 Local folklore has several alternative origins for the name. 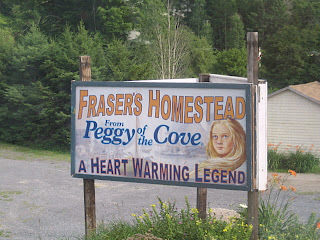 Some people claim Peggy was an early settler. Others say she was a young survivor from a shipwreck who remembered nothing of her life before her rescue; not even her name but was given the name Peggy by the family who adopted her. Last stop on the tour was Peggy’s “home”, a historic home done in period design, with the owners in costume too! Long, long day – Penny was very happy to see us! Early to bed tonight for sure!